Despite President Trump’s call for a coal power renaissance, companies like GM, Target and Starbucks are following Google and Apple in deals for solar and wind energy. It’s not just Google, Apple and a few other tech powers that are going green with deals for new buy electrical power from renewable sources. Now just about every kind of big company is doing so in a surge of power purchase agreements and other investments that curtail greenhouse gas emissions. In 2017, non-tech companies that ponied up for renewable energy include Starbucks, Target, Partners HealthCare, General Motors, paper manufacturer Kimberly Clark, cereal maker General Mills and brewer Anheuser-Busch InBev. “The corporate renewables market is now seeing deals from all industry sectors,” said Kevin Haley, marketing manager at the Rocky Mountain Institute’s Business Renewable Center, which tracks such deals, on Monday. “An increasing number of nonutility buyers … believe they need to be part of the sustainability solution.” It helps that renewable energy is getting cheaper, he added. Renewable-energy purchases have happened for years, in part because of expectations that regulations to deal with climate change would make fossil fuels and carbon dioxide emissions more costly. Now, though, the Trump administration is pushing the opposite direction — trying to revive coal as an energy source, repealing the Obama-era Clean Power Plan that targeted coal power plant emissions, withdrawing from the Paris climate agreement to decrease greenhouse-gas emissions and wiping out mention of climate change from government websites. But at least some businesses are still pushing for sustainable energy. 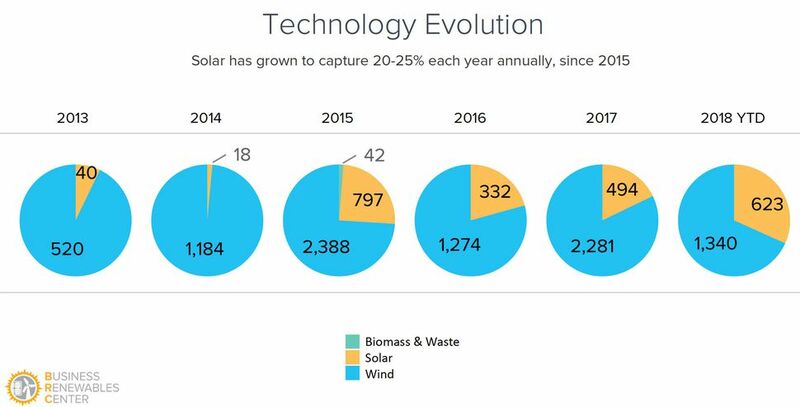 So far, renewable energy deals in 2018 are on pace to surpass the 2.78 gigawatts worth of power in 2017’s publicly announced deals, the Business Renewable Center figures show. So far this year, they’ve signed up for 1.96GW, which if sustained means renewable energy could surpass the peak of 3.12GW in 2015. From 2008 to 2013, only four companies signed deals for renewable energy: Google, Apple, Walmart and cleaning products maker SC Johnson. From 2013 to 2018, though, 51 more companies joined the trend. 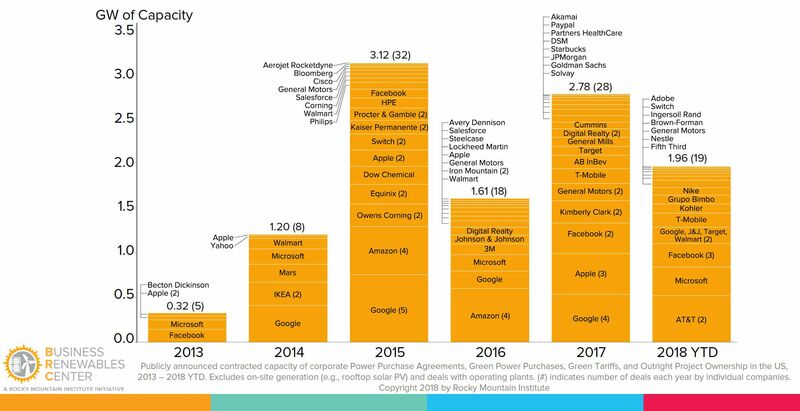 Tech companies including Amazon, Facebook, Microsoft, T-Mobile and AT&T joined Google and Apple, and their collective appetite still accounts for more than half of the renewable power purchased. AT&T is a relative latecomer, but in February it announced plans to buy an immense 520 megawatts of power from wind farms in Oklahoma and Texas. “AT&T recognizes that climate change is a problem,” the company said in announcing its deals.